Generations of kids grew-up watching Rex Trailer’s long-running “Boomtown” on television as he brought a bit of “the old west” into New England homes. Rex Trailer grew up in Texas and learned his cowboy skills while spending summers on his grandfather’s ranch. The ranch workers were rodeo riders who advised the young Trailer to stay away from the “rough stock” and stick to rodeo performing. With that sage advice, Rex learned trick riding, rope tricks, bullwhips and marksmanship. As a rodeo performer, he met Western movie star Gabby Hayes at Madison Square Garden in New York. Hayes took Trailer under his wing and hired him to work at his Catskills summer ranch for kids. Hayes realized Trailer was a natural with kids and encouraged him to break into television as an on-air personality. In the fall of 1947, Trailer moved to New York City and applied to the Dumont Network, but no on-air positions were available. He knew working from the inside would be more beneficial so he accepted a job as a production coordinator and worked his way up to producer and director. One day, Trailer heard of a casting call for a cowboy to host a new kid’s show. 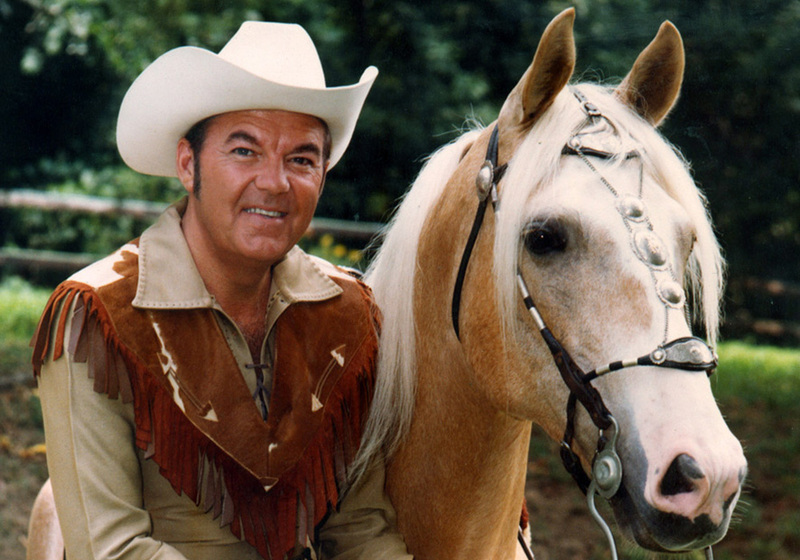 Rex landed the job as the host of the “Oky Doky Ranch” and began his career in children’s television on the Dumont Network. In 1950, the Westinghouse Broadcasting Company offered Trailer a contract as their on-air children’s personality at their WPTZ station in Philadelphia. From 1950 to1955, he was the host of three shows, “High Noon with Rex Trailer,” “Riding the Trail,” and “Rex Trailer’s Ranch House.” With 13 weeks left on his contract, Westinghouse sold the station to NBC. He was offered to play out his deal at their stations in either Cleveland or Boston. Trailer chose Boston and that 13-week contract would last nearly 20 years. On April 28, 1956, “Rex Trailer’s Boomtown” premiered on WBZ-TV in Boston. The show was an instant success. Every Saturday and Sunday morning “Boomtown” was on the air live for three hours. More than 250,000 kids would appear on “Boomtown” over the years and more than 4 million watched from home. The show offered entertainment, educational games, films, cartoons and outdoor adventure. As the demands of network airtime encroached on the local television markets, “Boomtown” signed off WBZ-TV in 1974. Westinghouse then developed a program called “Earth Lab,” a science show for kids and teens and chose Trailer as the host. So, he took off his cowboy hat and explored other worlds that were of interest to him such as NASA’s space expedition. The show was nationally syndicated and enjoyed a successful run in the mid-1970s. In 1977, Trailer found his current home at Emerson College teaching on-camera performance and television production. Many of his students have gone on to great success in news and entertainment. Rex has written and recorded many songs over the years and enjoyed performing at personal appearances and parades with his horse Goldrush. He was president of RTV Productions in Waltham, Mass., producing commercials, industrials and documentaries.